February 17th: the Friday that started the winter recess. Before students took some time to relax, go on vacation, hang out with friends, and just take a break from schoolwork for a week, everyone took time out of their day to give back to those in need. Friday, February 17th marked the annual Students Rebuild Challenge. The organization is run by the Bezos Family Foundation. This foundation was started by Jackie and Mike Bezos in order for all kids to be able to make their own significant mark on society. Their son, Jeff Bezos, is the CEO of Amazon. Each year, Half Hollow Hills eagerly accepts the Student Rebuild Challenge. In 2015, the district collectively made 7,958 bookmarks to help promote literacy in countries such a Peru, Mali, and Nepal. All of the bookmarks that Half Hollow Hills made lead to the Bezos foundation donating $15,916 to the Save the Children’s Literacy Boost Foundation. Last year, Half Hollow Hills came together as a district to create pinwheels to support Syrian refugee children. Each year, HSE students face a difficult challenge, but Half Hollow Hills takes on the obstacle with great passion and determination to excel and assist those who are in need all around the world. The Students Rebuild Challenge for 2017 was no different! This year, the challenge we faced was poverty. While children all around the world have dreams of what they would like to do with their life and who they will become, many people have to face the harsh reality that their dreams are impractical due to the daunting conditions of living in poverty. Since their basic needs for life are not being met, in many cases, their education becomes less of a priority. The Bezos foundation wants to take steps, even a leap, towards ensuring that no child has to face these harsh circumstances and to help pave a better life for children all around the world. This year, instead of pinwheels or bookmarks, we created hands. By accepting this challenge, these hands symbolized the HSE student body lending a hand to those who are facing poverty. For every hand made, the Bezos Family Foundation donated $1.90 and ended up with $500,000 to donate to the Save the Children’s Programs, which helps youth in Nicaragua and Indonesia win the fight against poverty and obtain a better life that they envisioned for themselves. 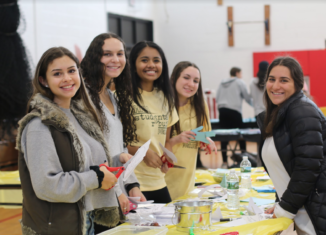 Mrs. Cullen’s Amnesty Club and Girls Learn International Club, Ms. Uttendorfer’s National Art Honor Society, and Mrs. Nolan’s Future Educators Club all worked in tandem to make sure this year’s challenge reached new heights. Future Educators Club prepared a lesson on poverty to teach at all of the elementary schools in the district so they can contribute to the challenge as well. All of the students in the participating clubs were able to attend these field trips to help the elementary school students lend their helping hands. Speaking from experience regarding my involvement in the Future Educators Club, I always have a wonderful time going to the elementary schools to teach these lessons to the students. It is such an enjoyable and rewarding experience to teach the elementary school students the importance of giving back. During each social studies class on Friday, February 17th, every class went to the East Gym for half of the period to lend their hand to the challenge. As every student entered the gym, music blared as each class found the respective table a to get down to business. At each table, two representatives from one of the clubs running the challenge were in charge of the table and helped make hands as well. Everyone was ecstatic to create their hands and contribute to the cause. The enthusiasm that ran through the gym made the experience of contributing to the community even better. Mrs. Cullen made sure to go to every table in order to ensure that everyone was staying on task. In fact, she even came over to my table at the beginning of the period and said “each of you can at least make six hands!” Some ambitious students even made eleven hands, proving their serious dedication. Throughout the whole day, there was a gigantic bake sale with a plethora of breathtaking baked goods. The money from the bake sale would also go towards HSE’s grand total raised for the challenge. By the end of the day, everyone was eagerly anticipating the total amount of money that High School East made. In the end, our school made 19,165 hands which is equivalent to $36,411 for Save the Children! The 2017 Students Rebuild challenge was a complete success! Participating in this challenge was truly an unbelievable way to give back and help those in need. Personally, the challenge was a very self- reflective experience. The 2017 Students Rebuild Challenge inspired me to always lend a helping hand to those in need all around the world, by participating in the challenge, or even volunteer at organizations in our very own community to help lend a helping hand to those in need right here on Long Island.